New Summit Fire & EMS Board members Dave Steele, Jim Cox and Ben Broughton, in back, and Jim Lee and Lori Miller were sworn in at the first SFE board meeting on Thursday. 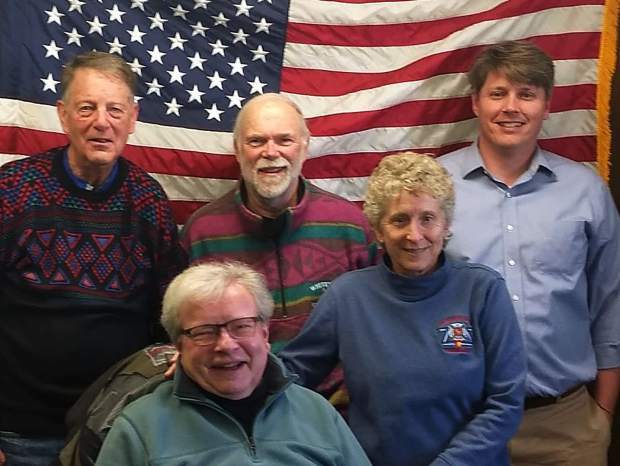 The newly established Summit Fire & EMS Authority created its board of directors at its first meeting on Thursday, comprised of citizen representatives appointed from both the Copper Mountain Consolidated Metropolitan District and the Lake Dillon Fire Protection District. Those two agencies announced they would be merging together in October last year. Moments after being sworn in by attorney Emily Powell, the new board members unanimously designated a leadership slate of President Jim Cox, Vice President Dave Steele and Treasurer Lori Miller. Jim Lee and Ben Broughton rounded out the SFE Board, which is responsible for crafting policy for the joint fire authority. In creating the new organization on Jan. 1, Summit Fire & EMS combines the forces of Lake Dillon Fire and Copper Mountain Fire, although both districts remain in place for legal purposes, such as for collecting property taxes. Each department designates its representatives on the SFE Board.